This green Pu-erh beeng cha was produced by the Haiwan Tea Factory - a young factory that was founded in 1999, the factory director Mr. Zhou Bing Liang is the retired manager from the Menghai Tea Factory. Mr. Zhou is now in charged of the complete tea processing methods to guarantee a premium quality. 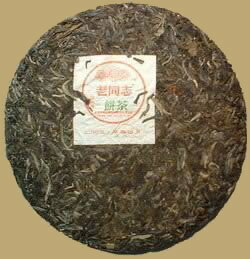 This 2005 vintage raw Pu-erh cake is perfectly fine to drink as it is, or putting away for further aging.